From swimming pools and terraces to roofs and floors, I cover a large range of general building projects. Based in the Languedoc region of southern France between Avignon, Nimes and Uzes I work in the departments Gard 30, Vaucluse 84 and Herault 34. As a Professional Artisan Maçon, I offer a free guaranteed quote, registered trader details and references of previous projects. I am fully bilingual in French and English, having lived in France since 1996. Have a look over my photos and testimonials and feel free to contact me about your building project. - Full bathroom fitting including plumbing and tiling, renovation or new build. - Competitive daily or hourly rate for smaller jobs, possibility to work with client on jobs. With the current Greek crisis continuing and an already fragile housing market, many parts of France are experiencing upto a 40% drop in property prices. 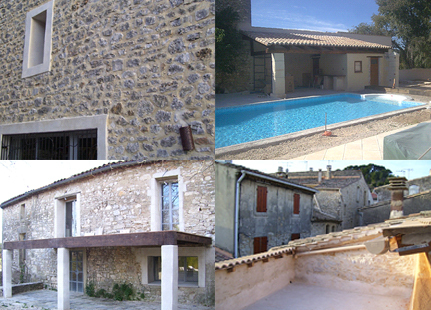 The Languedoc region (sun belt) is definitely on the down, with your average “villa” now going for between 190 and 250K euros-down from 300 to 400K in 2008. Remember, all advertised prices, by agents or sellers direct should be downed by another 20%. The market has’nt been this good to Brit buyers since 2000.